Ever since throwing across his body in the 2010 NFC Championship game, the Vikings and all other Minnesota sports teams, have been cursed. The Vikings found this out firsthand when Favre decided to come back for a second season. Who can forget the comedy that was the 2010 season? The team ended up trading a 3rd round draft pick to the Patriots in return for Randy Moss, who was ultimately released by the team. Brad Childress was fired. The NFL Ironman himself had his consecutive games streak snapped at 297 after being destroyed in the Bills game. Then the Metrodome roof collapsed under heavy snow, which forced the Vikings to play their home games at Detroit and then at TCF Bank Stadium. What about the 2011 Vikings season…sure is going swell, isn’t it? In their first 3 games, the Vikings have went into the half with a double digit lead, and somehow found a way to lose each game in the second half. It’s almost like Brett Favre’s tenure with the Vikings….The first half was great football and in the second half, everything goes to hell. The Vikings aren’t the only Minnesota sports franchise to fall victim to the “Curse of Favre”. Remember back in 2009 when the Twins had an MVP catcher named Joe Mauer? The next season, which started a couple months after Favre threw across his body, wasn’t very Mauer-like at all. Mauer was ailing from numerous injuries during the season and couldn’t replicate his numbers that helped him sign a $23M/year contract. 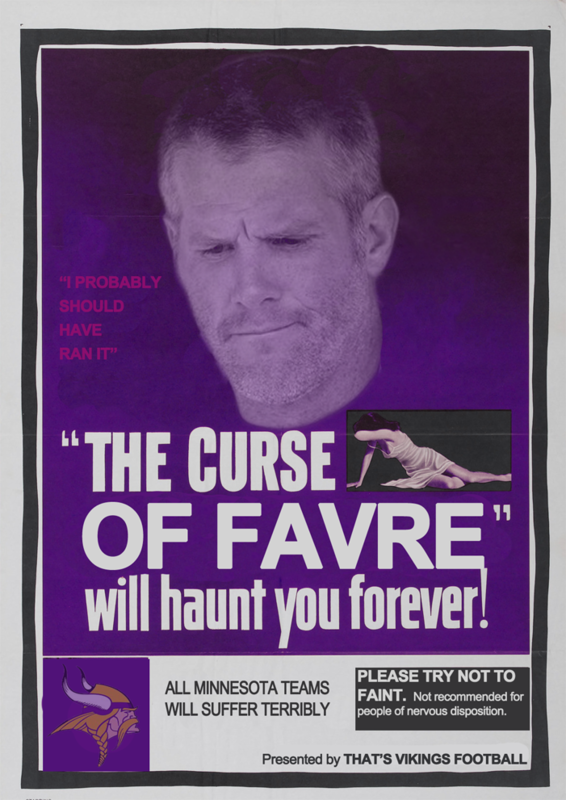 I think the curse wanted to see if Mauer was Favre-like and play effectively through pain. Another 2010 Twins victim was Justin Morneau. The Twins Canadian first baseman was putting up some of the best numbers in baseball prior to the All-Star break. Unfortunately, the curse decided it was time for Justin to have a concussion on July 7th and he was lost for the season. The 2011 Twins have felt the full brunt of the curse. After a Vikings season that was so crazy that you couldn’t have made it up, the Twins did their best to match it. Nearly every Twins starter has been hampered by injury this season. Those injuries, along with pitching-to-contact to a poor defensive middle infield, have the Twins on the precifice of a 100 loss season. They currently have 99 losses with only 2 games remaining. If I were you, I would prepare for 101 losses. Digging deeper into the 2011 Twins season…. Mauer’s 2011 campaign has been impacted by things called bilateral leg weakness, general soreness, and pneumonia. He’s gone from one of the best catchers in baseball to one of the best punchlines on twitter. Michael Cuddyer had to have a freaking wart removed from his foot in spring training. Justin Morneau still hadn’t fully recovered from his concussion and then started having neck and shoulder issues. Denard Span missed a significant amount of time because of a concussion. Twins top pitching prospect Kyle Gibson went under the knife for Tommy John’s. I could go on and on about this season but I won’t. Then there’s Gophers Football. Team is horrible in 2010, gets a new coach, who then has a seizure on the sidelines of the second game of the season and now is taking leave to figure out his health issues. Those are just a few examples of what “The Curse of Favre” has brought to the Minnesota sports scene. I could name more examples but that would be too depressing. Just know this…Minnesota teams are cursed, there’s no question, and it’s all thanks to that former Viking quarterback and amateur photographer who wears crocks, Brett Favre.